Since 1987 I have been successfully importing products from China & the rest of the world. I put my decades of experience to work for you as I make the entire process as simple as possible. Since 1987 I’ve Been Successfully Importing Products From China & The Rest of The World. Put My Decades of Experience To Work For You As I Make The Entire Process As Simple AS Possible. Want to know more before buying the book? Updated constantly so you know the information you are getting is current and relevant (fully 2018 ready). Buyers receive all future, updated versions for FREE! You’ll never need to see the product. How to avoid the many deceptive product-sourcing web portals. These appear safe because they have thousands of suppliers listed, but are hazardous to your financial well-being. Get safe access to reliable suppliers by using the very few safe sourcing web portals that I recommend. How to buy small amounts at factory prices to try importing on a small scale. 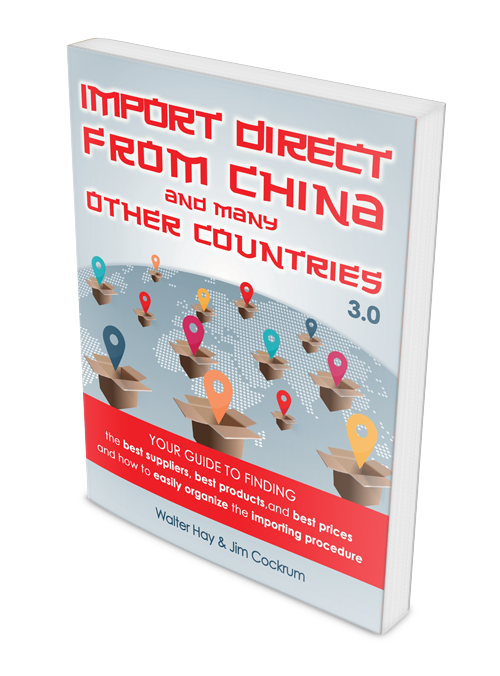 In just 133 pages learn how easy importing can be. Why buy a complicated course or a big eBook that will take you many hours or days to study? How to avoid having to learn all the rules and regulations. Use other people’s expertise. Learn to recognize and avoid the widespread misinformation circulating on the web, including the risky sourcing practices often recommended on internet marketing forums. How easy it is to import and how to minimize your risks. How to turn Customs clearance from a nightmare into a piece of cake..
A ridiculously simple trick of the trade to make sure that you get the best prices. How avoiding haggling is an important trick of the trade. How to avoid freight rip-offs that could potentially bankrupt you is another trick of the trade. How to access genuine manufacturers rather than dealing with unreliable agents. Identity of a trade organization that only the “big boys” know about: a valuable contact point to help you find reputable manufacturers. Avoid these two big risks when obtaining samples. Licenses – do you need them? Deciding which products to import. Why the size of the product can be important. Locate items in places other than China at even better prices or better quality for the same price. Good reasons why you should avoid drop shipping and deal directly with the manufacturer. How to be sure you are dealing with a real manufacturer not a reseller or agent. How to get your mail service to handle your Customs clearances at no cost to you. Step-by-step instructions with a check list of things that must be done when ordering. Suppliers will come to you if you use our simple methods. Recently the “Proven China Sourcing” training that is sold here was added as supplemental material to the best selling and most comprehensive “how to sell on Amazon” course in the world – the ProvenAmazonCourse.com (we call it PAC). Your purchase of the “Proven China Sourcing” entitles you to a $48 discount on the PAC course at any later date should you choose to upgrade. We’ll send you the link when you order. Expansion of the Ailbaba section, with advice on how to safely use that site. Detailed report on Alibaba’s Trade Assurance system. Their rules have been expanded substantially. Addition of sections dealing with Importer of Record, Customs Bonds, and Power of Attorney. There are now 27 links to help source products outside of China, including more detailed site navigation help, and a few paragraphs on making sourcing requests through places other than B2B sites. Inclusion of an important warning note about Aliexpress dropshipping. Expanded chapter on Inspection Services, mainly resulting from changes to Alibaba’s listing of those services. Information links dealing with labeling requirements. Updated Glossary, including a link to Incoterms. guarantee-gold-01If you aren’t entirely satisfied with your purchase please call, or drop us an email and we’ll quickly issue a refund of your entire purchase amount. Take your time, check it out, and more importantly put this powerful information to work for you, but if you find it’s just not for you we don’t want to keep your money. All support and contact options can be found at JimCockrum.com on the “contact” page, as well as in the email you’ll receive upon ordering. Why do we ask for your phone number as part of the order? Because Jim Cockrum or someone from his staff will contact you to make sure you got your order and to offer you a free Q/A session about this and any other of our products. Jim makes several calls per week as a way to stay in close contact with his readers. When we call you, you can expect a friendly, informative chat with someone who truly cares about your success. We leave every contact ‘better than we found them’ 100% of the time. There is no ‘high pressure pitch’ or ‘up-sell’ and we won’t share your name or contact info with anyone. I just bought your book as I just reached a obstacle and felt that your book would benefit me and it has…. your book is GOLD. I bought the book a few days ago. It made me realize that I’ve been wasting my time contacting wholesalers rather than manufacturers. I also didn’t have much idea about what needed to happen if I made a purchase from the supplier. It has a good checklist to avoid some pitfalls. It’s only $100, not much if you’re going to buy some products really. If $100 is a barrier to getting into business then you’re going to have trouble making any real money. I read through your book. Very informative and to the point, I liked it. Helped clear the air on some questions I had. It will be a great reference in the future as well. I also bought your book and finished reading it today. I’m new in the importing industry, and your book simplifies the process. I feel much more confident to go through to import products. Thanks again. A very, very satisfied customer of your digital products thanks a lot for all your work you have no idea how many people you impact with your knowledge and experience who import etc. here on the forum THANK YOU. I bought your ebook a little under a year ago and printed it out. It’s great! I love it! I recently picked up Importexport’s book and it has been very valuable. It is far better than any other that I have looked into which all seem pretty light on details other than “go to alibaba and start emailing manufactures.” I recently decided to launch my own business, so I am very new to all of this, but I would absolutely recommend this book. I highly recommend Walters book on importing. There are a lot of books and courses out there but if I had to choose one to start with I would definitely recommend Walters book. Just finished reading your book, very helpful. Can strongly recommend it to anyone that want to get more insight in export/importing. Hey Walter, I ended up picking up your ebook a few days ago and finished it within the day. There is loads of valuable logistical information in there that will save me a ton of headaches, especially later on in the process. The resources you posted are also invaluable – you were not kidding when you said you would provide a wealth of resources for sourcing from countries other than China. For anyone reading this who is contemplating buying it solely for the list of resources (this is only a fraction of the value Walter provides, but was the main reason I made the purchase), I highly suggest taking the plunge. The few hours and small change I spent on the book has already led me to more progress than I had made from scouring Alibaba for hours on end looking for a product from a trustworthy supplier that wasn’t already on the market. Just wanted to say that I purchased your ebook a few days ago, and I was very impressed how much information you gave. I thought for $97 it was a heck of a deal. Haven’t sold on Amazon and now I’m looking to offer private label goods on Amazon/Ebay. Of course the immediate supplier allure was Alibaba, but you’ve smacked that thought out of my head! LOL! I enjoy reading the insights from folks that have a legit background in something like yourself. I really respect your knowledge, experience and opinions about importing, and realize you are a walking encyclopedia on the subject. I’ve been studying the methods you teach in your book for about 2 weeks now. You are my superstar! I even do not know you but I would already like to say that you have saved me and my money – thank you. I read your book on sourcing about two months ago, I learned a ton that helped me recently place my first orders from Chinese manufacturers. So thank you very much, I got a ton of value, I feel like you saved me a lot of money and more importantly a lot of headaches. You literally just saved me 280USD. So I was about to place a sample order from this supplier, but I googled them as per your suggestion….and found horribly negative reviews of the supplier pulling bait and switches on people. First of all thanks a million for writing your book. I read it a few weeks ago and it truly is invaluable. I just finished your book and WOW a lot of golden nuggets in there. It is like a treasure chest of knowledge and tricks of the trade for importing. It was worth the money, in the long run it will save readers a load of money. What is 97 some dollars in comparison to thousands of dollars. It may not be a 300 page book but that is because there are no stories and all that. Hope all is well. I have read your book several times and recommend it to anyone looking to learn more about importing. Hope you are having a great day. Just writing to say I loved your book. The writing style was so refreshing. NO bs, to the point, loved it. I purchased his book last week, it’s an awesome book! Straight to the point.. And didn’t have to waste my time reading many worthless pages!! I found many manufacturers, and drop-shippers. But to be honest I don’t want everyone buying his book, so I won’t have as much competition!! Thanks a lot for such an awesome book. How are you sir? I must confess I can’t wait to get back to you. It’s a victory report this time, not questions like usual. I just received my first sample order from a supplier. It’s a memory card, all tested with an app and confirmed products to be genuine quality. So funny how the right set of information works! I can’t explain how happy I’m. I’m using you book as my importing bible, I’m putting my trust in this, I’ve seen XXXXX who does lectures about importing from China and he asks for a lot of money for his dvds and seminars. Hope this email finds you fit as a fiddle! I purchased your eBook last night and it is a treasure trove of excellent advice and information which I am working my way through. Thank you so much for writing it! Walter doesn’t really plug his book, but you should buy it if you’re serious. Listen, I have been importing since 2005. I’ve been to China a couple times, I feel like I’m pretty experienced with small order importing (i.e. not containers). I bought the ebook thinking if I learned something, great, if I didn’t, he offers a money back guarantee. The book is worth more than he charges for it. If you really want to get serious about it, I guarantee you, his book will save you a boatload of troubles or money. You should not be on the fence about his book. No matter where you decide to import from, you’ll get value from the book that far exceeds the cost. I ended up placing small orders with 3 different manufacturers and am currently in the process of arranging shipping through Freight Forwarders. In this process, I think your tip on getting full quotes, in writing, alone has saved me a ton of headaches. So again I just want to say thank you very much! Ok. From extremely skeptical to successful completion. Credit given where credit is due. I followed the book instructions you laid out. Took my time to double check everything and was able to successfully import an order from China. Not only that but it was also a “sample order” for less than 300.00. A 300% mark up has allowed to get initial investment back and I have 70% of my inventory left. Stop promoting your book. Your encouraging competition for me Many thanks. I bought the book and I’m reading it right now. I’m happy with the purchase there is much more to importing from China then finding a manufacturer after you’ve found the manufacturer there’s more stuff to verify that if you don’t do you could regret. So this book is a must even for those that think they already know it all. Incredible information in here – just the websites he suggests in his book alone are worth the price – I’ve been in contact with at least a dozen manufacturers as a direct result of his book and have likely found one that’ll help me expand to many more products. I’ve followed all of his advice to the point of even getting (and contacting) references from the manufacturers. The very first thing that I did was purchase Walter’s book. It’s worth every cent. Your ebook is golden and I’m not even finished yet! I have recently purchased and read Walter Hay’s book on importing from china. It is a very good book and well worth the money. I just wanted to say thank you for all the information you provided in your e-book. Prior to reading your book, I had ordered a few samples on Alibaba for a product I’m interested in importing, and I have been trying to make heads or tails of what my profit margins would be (too low IMO). After reading your book, I was able to find the real deal manufacturer for my product. It was soooooo much cheaper. I feel like I was totally swindled on Alibaba, but at least it was a $200 mistake, rather than a $2000 mistake. I’ll just have to chalk it up to an expensive lessons learned. Hey Walt, been a long time my friend. Hope all is well. When I seen your name over in PAC, I was reminded of just what a masterpiece your book really is. I remain forever in debt to you. For anyone who hasn’t bothered to read all the glowing reviews (or the infinite amount of wisdom-laden posts on this board from Walter) please know that this book is the Rosetta Stone of importing. I just wanted to thank you personally for all of your help. Especially your tips on saving face. My Chinese supplier is now throwing free samples at me; simply because I took care to be polite and understood his culture, which is down to you. Thank you Walter, your help is very much appreciated and thanks again for providing such great value in the ebook! Walter’s book can literally save you thousands on Importing. I read your book on importing, and it was great. I have it open when I’m looking for suppliers. Thanks so much man. Thanks for your book, it’s going to save me a lot of headache and money. I’m confident in dealing with manufacturers overseas because of Walter Hay’s book. Walter Hays is an awesome individual and his book is gold. Don’t hesitate to buy it. Amazing reference from a real master. Walter’s book serves as a great primer for getting into the import game. Knowing how to “communicate” and speak their business language is critical and I feel Walter’s book does a great job in going into those details. I just finished your book. Awesome resource, very worth the money -thanks for putting that together. I bought the “Buy direct from China” ebook a while ago). Just wanted to leave a quick note here for other people considering the purchase. I put in place a lot of the techniques that the ebook discusses in terms of dealing with the suppliers. I can’t stress enough how invaluable the information was in helping us set up the relationship with the supplier. This directly allowed us to add another 5 figure profit stream to our ecommerce business. I am once again looking to source a few new products, and the first place I am looking are the sources in this ebook. I highly recommend the book Walter wrote on importing, if you are interested in importing from China it’s a must read.